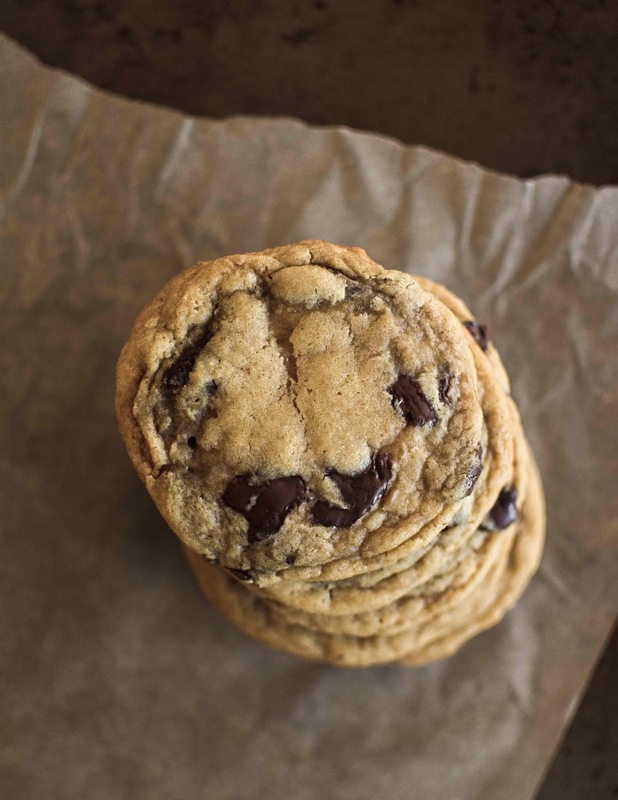 From Levain's mountains of gooey goodness to your mom's homemade cookies afterschool, there are a million and one ways to bake chocolate chip cookies. Each recipe caters to a unique preference! 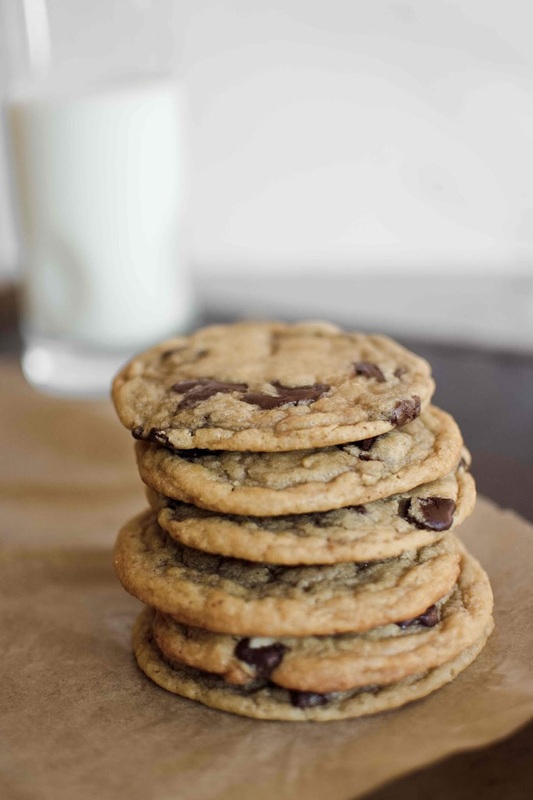 How do you like your chocolate chip cookies? 4. Crackled and textured on the top. 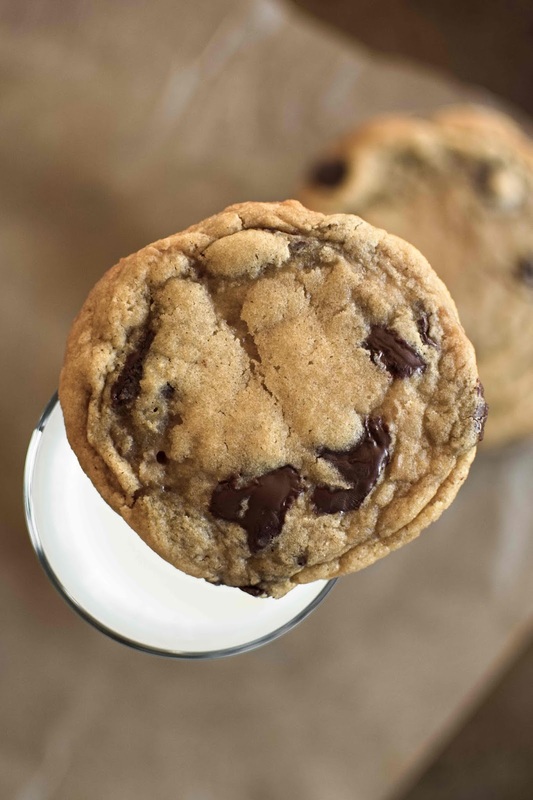 After years of failed batches and research about cookie science (the best kind of science out there), I've finally found a recipe that I love and developed a procedure for baking my perfect chocolate chip cookie, and I'm excited to share it all here. 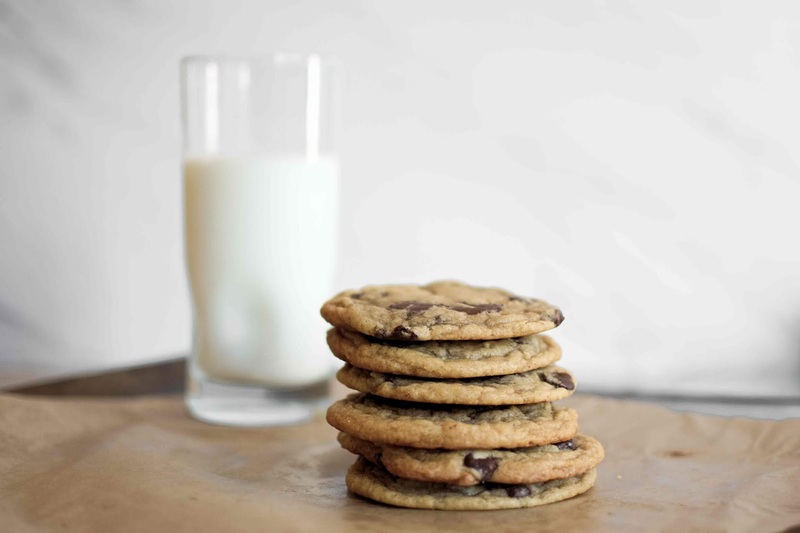 These cookies are my go-to food gift, and they were well-loved by the hospital clinicians and research department this past summer, so I'm confident you'll like them too! 1. All of your ingredients should be at room temperature - that means your butter and eggs should be sitting on your counter for at least 1 hour (maybe 30 minutes if it's summer and your kitchen is pretty warm.) Cheat if you must by submerging the eggs in hot water and microwaving the butter until slightly softened, but you risk over-heating and melting the ingredients. 2. Weigh your ingredients. Using cups as measurements isn't very precise nor accurate. Flour, particularly, presents as an issue. Some people measure by scooping the flour directly. Others spoon flour into the measuring cup and sweep the excess. This sounds excessive, but I promise you that the ingredient measured can vary from baker to baker. Weighing your ingredients gives you a higher chance of success because you're using more accurate amounts of each ingredients. Baking requires precision with ingredients; it's arguably more of a science than it is an art sometimes! You'll appreciate the consistency of your batches in the long-run, too. There's nothing quite as disappointing as wondering why your cookies didn't turn out as well as they did last time. Plus, clean-up is easier when you don't use measuring cups! 3. Cream your butter and sugar very well. This will take about 5 minutes; I use an electric, hand-held mixer for ease, but it all works by hand, too. This is crucial for integrating the butter with the sugar, which (among a few other factors) will greatly impact the degree of cakey-ness or crunchiness of your cookies. 4. The chocolate. 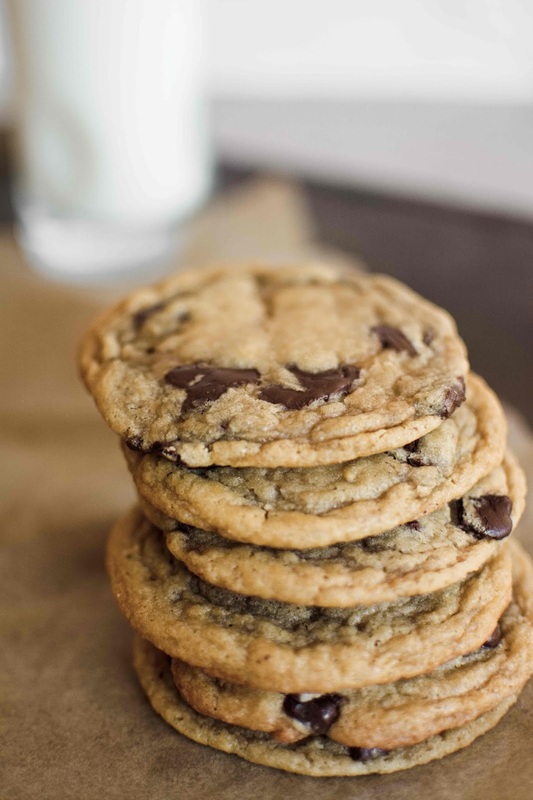 You want a good chocolate:cookie ratio, so don't skimp out (though the quantity listed in the recipe below is a lot - I often scale the chocolate down by eye, adding just enough to have chocolate in each bite; good chocolate is pretty expensive!). My best batches of cookies tend to have multiple types of chocolate - mix up % cacao and textures (chips, chopped bar, chunks, disks)! Press a few extra pieces of chocolate on top of your cookie dough balls before baking to make them look even better! 5. Chilling (or freezing) your dough allows the dough to develop deeper flavors while firming it up to avoid overspreading. Try not to skip this step! Don't worry if you can't wait, though - I've baked the cookies directly after making the dough before and never had an issue with overly thin, crunchy cookies. 6. 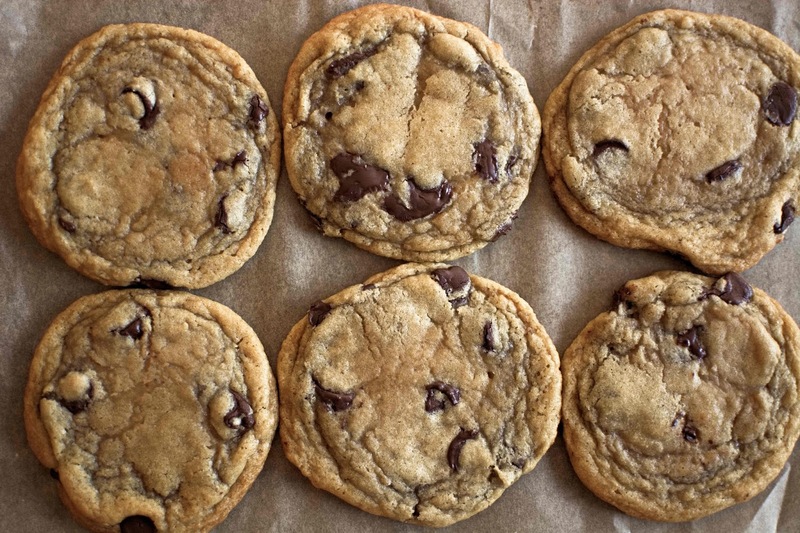 Bake evenly sized cookies that aren't too small. I've found that too-small balls of dough cook too quickly and are harder to control. The dough needs to be in the oven long enough for slightly crisped edges but barely undercooked centers. The gooey-ness of the centers is what lends that soft texture out of the oven and the chewy texture after cooling fully (my favorite). 55 g balls of dough are my standards. 7. Now the secret, which I recently found out isn't so much of a secret... Slamming the cookies when they come out of the oven! Apparently Sarah Kieffer popularized this method, but I promise I discovered it by happenstance. Slamming the cookies that are still gooey and soft will produce the gorgeous, rippled, crackled texture on the cookie surface. Sarah recommends slamming the baking sheet periodically throughout the baking process, but I've been well pleased with only doing so after the cookies are fully done. I currently don't have any parchment paper in my new house, and banging the non-stick baking sheet has required a bit extra force. With parchment paper lined sheets, however, you can lift portions of the parchment and drop them to "spot-fix" individual cookies if they need a little extra help. Banging the entire sheet with extra force risks over-agitating the more delicate cookies on the same tray. Let's just say I've run into a few cookies that have split apart completely. In a medium-sized bowl, whisk the flour, baking soda, baking powder, and salt. In a large bowl, cream the butter for about 1 minute. Scrape the sides and add both types of sugars. Cream the butter and sugars for about 5 minutes, or until light and fluffy. Add the eggs, one at a time, mixing for 1 minute after each addition. Stir in the vanilla. Add the dry ingredients and mix on low, just until the dough is combined. Fold the chocolate in by hand with a rubber spatula or wooden spoon. Cover the dough and refrigerate for 24-36 hours (if you can wait that long!). You can also portion out the dough (55 g = 2.2 oz dough balls) and freeze them at this point. 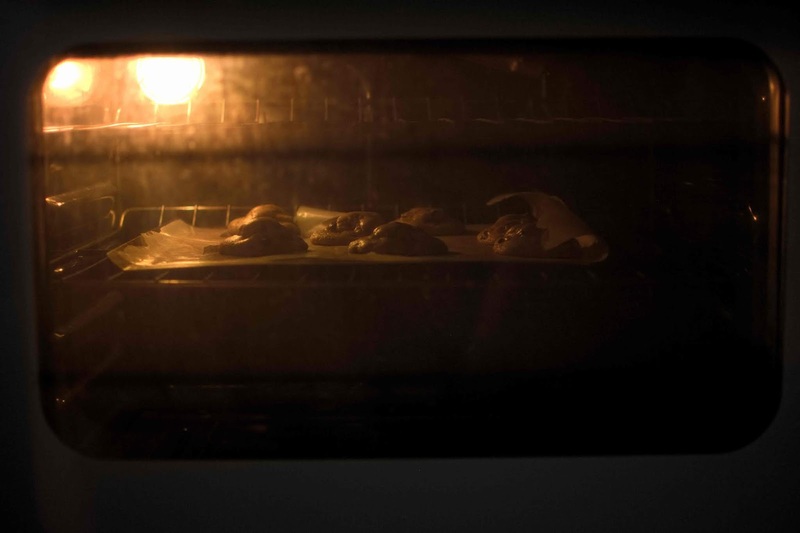 Preheat the oven to 350*F. Line a baking sheet with parchment paper. Portion out 55 g balls of dough (about the size of a normal golf ball; about 2.2 oz). Bake for about 12-15 minutes (15-18 minutes for frozen cookies), or until the bottoms are golden brown and the centers are barely set (barely gooey). As the cookies are baking, place a dish towel or pot holder under a wooden cutting board. Once the cookies are done, immediately take the baking sheet and slam it against the cutting board several times to deflate the cookies. Let the cookies cool on the sheet for 10 minutes before transferring to a wire rack. Eat within the first hour for soft, gooey cookies. 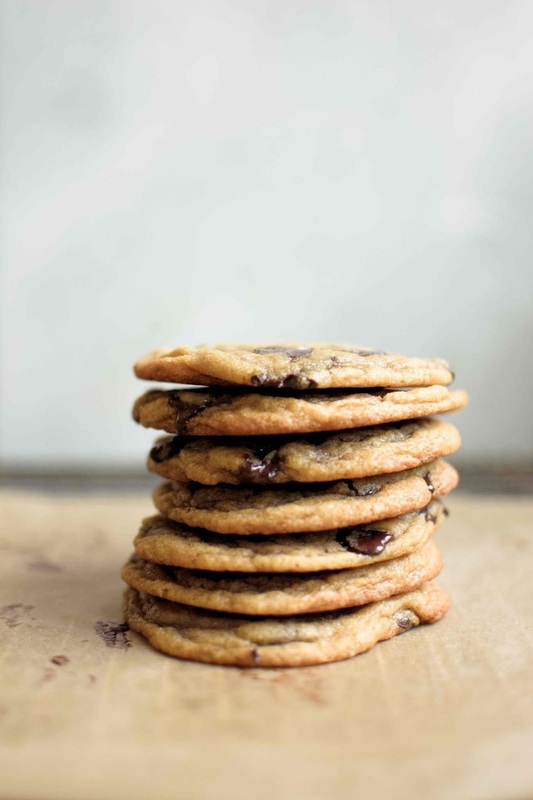 Cookies that have cooled fully (1-2 hours or overnight) are chewiest. *Use high-quality chocolate when possible. I particularly like Guittard's semi-sweet baking wafers; I like supporting a brand that cares about social responsibility!